$795.00 In stock - low quantity. Order in the next 9 hours, 49 minutes and it will go out today! This isn't your grandfather's floating ball. First developed in 1998 for a pop-concert arena tour, ORB is the modern twist on this classic illusion -- a floating ball of pure light! Measuring 30cm (12inch) diameter, ORB is visible on the biggest stage and makes the classic floating ball effect even more deceptive. Thanks to its high power, internal light source, it eliminates the need for complicated theatrical lighting to highlight the ball (that also highlights the thread!). It is the fastest and most practical floating ball for the touring, real-world working performer to set up. The internal light source creates a unique, smooth-and-even glow. Best of all, you can change the color of the light at any time -- EVEN WHILST FLOATING -- using the wireless remote control. There are 16 colors to select, plus the ability to scroll gradually through all the colors in a swirling rainbow pattern. 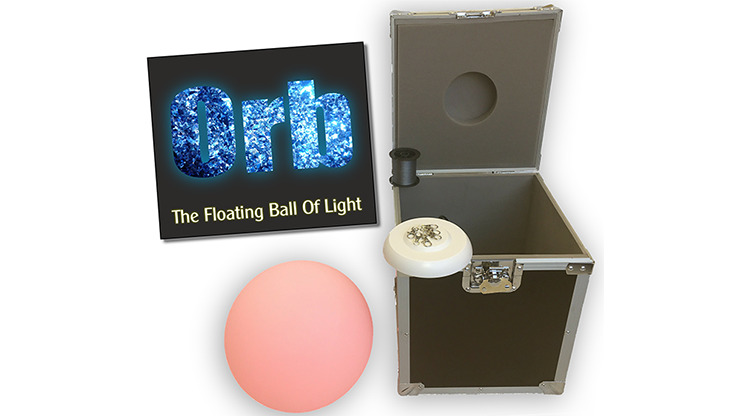 You can even adjust the brightness -- imagine the possibilities in your floating ball routine! ORB has been tested with every major thread-based floating ball hook-up (Abbott's, Okito, Don Wayne, deMatos, d'Hotel). It is also provided with Thomas's top-secret hook-up system designed for performers working large stages and arenas. This enables you to send the ball floating higher and further than traditional hook-up systems allow. The strong ABS plastic ball is designed to survive the knocks-and-bumps of touring life. It comes complete with charger (110-240v), remote control and a 200m spool of Thomas's special floating ball thread. This is HALF the diameter of every other "floating ball thread" on the market, and absolutely perfect for creating spectacular ORB performances. It also comes with all the clips, unique smooth-running eyelets and hardware you need to install this illusion in your show. ORB comes complete with a flight-case to transport the entire rig, and to ensure that this spectacular illusion is a practical and dependable addition to your show. ORB has been Thomas's top-secret weapon added to shows all over the world for the past 20 years. Here is your opportunity to add this unique and spectacular illusion to your show -- with the complete kit containing everything you need. ORB is available to order now!